I just watched the first trailer for Spider-Man 3 and... Well, let's just say it's done nothing to make me more excited about the movie. That's not to say I think it's bad or anything, but it simply hasn't whet my appetite any more. 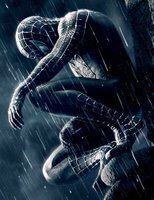 I know Tobey Maguire does well as Peter Parker/Spider-Man. I know James Franco and Kirsten Dunst will do well in their respective roles. Sam Raimi has proven that he can do a good job with the franchise. I've seen all that. I know the basic story of the black costume saga from the comics, so there's no real surprises there. The only really new things for me would seeing how Thomas Hayden Church and Topher Grace fit into the story and how well they do. Now I have a lot of respect for both those actors. I think they are both extremely talented and extremely under-rated. But the trailer does almost nothing to showcase their roles in the movie. I think both have a combined screen time of maybe 2 seconds. (There's a little more time with Church's character, but it's mostly CGI and not actually Church himself.) Ever since I first heard he was cast, I thought Church was an excellent choice for Sandman, but Grace as Eddie Brock strikes me as an odd casting choice. Again, Grace is supremely talented, but he doesn't strike me as the not-terribly-intelligent, body-building antithesis of Peter Parker that we've known from the comics. Interestingly, I can easily visualize Grace portraying a sort of dark mirror to Maguire's Parker. And, given some of the imagry in the trailer, it strikes me as a likely direction Raimi will have taken. But it's still a significant departure from the comics, I think, and I'm wondering how well or poorly that might work on screen. It could be that works very well; there are certainly a lot of story and character angles to work in that direction. But my point here, though, is that the trailer does not show that and, thus, does not entice me any more than I already was.